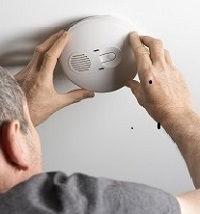 More than 500 vulnerable residents in Torbay will be given the opportunity of free life-saving safety checks at home as a result of a partnership between Mears Care and Devon and Somerset Fire & Rescue Service. Mears Care, which provides home care services for Torbay and South Devon NHS Foundation Trust, set up a partnership with the Fire Service in January 2016 to identify fire risks in service users’ homes. The partnership provides advice and reassurance, and even gives out fire-safety equipment, such as fire retardant bedding and mats, carbon monoxide detectors, as well as fitting smoke alarms. The project is being developed to provide fire prevention awareness training for care workers in Torbay. The driving force behind the project is Mears Visiting Officer Gilly Laskey, who comes from a family of fire-fighters, but also suffered a devastating loss, when her grandmother died in a fire caused by smoking in bed.